The Indian state of Karnataka is a great example of how a single state can have so much to offer in terms of terrain, features, and sights. It has beaches, hill-stations, and a host of small and big cities. The most remarkable of these, of course, is the hill station Coorg and the culturally rich Mysore. At a very close distance from each other, these two places will make for a lovely vacation destination. With 4 days at hand, we’ll take you to an unforgettable tour of Mysore and Coorg. The Mysore to Coorg Tour Package of 4 days – Interesting Places to Visit in Mysore and Coorg. Our four day trip of Coorg from Mysore begins at Mysore. We begin the day on a spiritual note by visiting the Chamundeshwari Mata temple at the Chamundi hills. After a hearty breakfast, we proceed to the Mysore Palace and dive into the rich history and culture that surrounds it. We then move to the Wax museum and the Sand museum. While the first one is dedicated solely to the musical arts, the second one boasts of being the only museum in India dedicated solely to sand sculptures. We then take you to the Karanji Lake, where you can take a walk and appreciate the flourishing nature in the confines of the city. Our next stop is at the Mysore Zoo, which is home to almost 168 species of animals and birds. Walk around and look at the wild life preserved at one of the oldest zoos in India. Time for some history, as we next visit the Jagan Mohan Palace, which has now evolved into an art gallery housing so many different paintings and art pieces. Spend some moments of peace and serenity at the Philomena Cathedral, the tallest of all the churches in Asia. Enjoy some spectacular bird-watching sights at the Ranganathittu Bird Sanctuary. Spend an enriching evening at the Brindavan Gardens and the KRS Dam. Walk between the flower-beds and see the sun go down on the great scenery. Stay the first night at Mysore. We start our Mysore to Coorg drive early in the morning and have a sumptuous meal to fill us with energy. 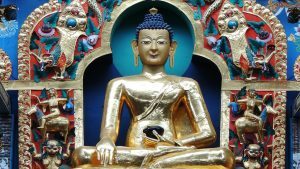 First on our list of places to visit in Coorg is the calm and peaceful Tibetan Golden Temple at the Namdroling Monastery in Kushal Nagar. Next, we visit the popular and favourite nature abode of Nisarg Dhama. Spend some peaceful moments here before reaching Madikeri. We then reach Madikeri and check-in at the hotel, followed by a hearty and warm lunch. Next on the list is Mercara Fort, a rich lesson in the history of Madikeri and its rulers. Indulge in some local shopping in the Madikeri Market. Recommended items include locally made coffee, chocolates, spices, and honey. Retire to the hotel room. Begin the day with some delicious breakfast. Seek blessings from Lord Shiva at the local Omkareshwara Temple. With spirituality and calm still in our minds, we move to the next on our places to visit in Coorg: Talakaveri. This serene spot is where the river Kaveri is believed to originate from. Visit the Bhagamandala temple, another beautiful temple dedicated to Lord Shiva. Also, witness the nearby Triveni Sangam, the confluence of river Kaveri, Kannike, and the mythical Sujyothi. Next up is the architecturally rich and calm Raja’s Tomb, the final resting place of the mighty Kodava rulers. Last on today’s list of places to visit in Coorg is the super enjoyable and serene Abbey Falls. Surrounded by the delightful coffee and spice plantation, this place is ideal to spend summer hours. Rest for the night at the hotel. The day begins with some sumptuous breakfast. We start the day with some spectacular sights at the Mandalpatti viewpoint. Check out from the hotel at Madikeri. Visit the spectacular and serene Chiklihole Reservoir. This is a favourite picnic spot for many people and will be yours as well. Next on the list of interesting places to visit in Coorg is the Barapole River Rafting, where the adventure and thrill seekers will enjoy rafting in the grade 4 rapids. Take a calm and peaceful walk at the Dubare Elephant Camp. If you fancy, there are elephant rides organized here as well. We drive you back to Mysore and drop you off at the place of your choice. What are you waiting for? 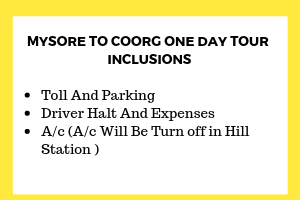 Fill the below form and get your Mysore to Coorg 4-day tour booked today!